Chalet Clarine was built in 2009 as a large luxury family home with one twin & three double bedrooms. It has two bathrooms (one en-suite), one wet room and all the facilities a modern chalet requires, including under floor heating, garage, private parking etc. The kitchen is fitted out to the highest standard with dual fuel 5-burner cooker, stainless steel work surfaces, dishwasher, fridge freezer, microwave, toaster, coffee machine, kettle, hand blender. For entertainment there is satellite television (French & UK), music system (iPod connector), DVD, Apple TV, Xbox 360 & games, media player, Wi-Fi and a number of family board games. Other facilities include washing machine & tumble dryer. There is a large south facing garden with a large decked area so you get the sun throughout the day (even in winter), with stunning views of Le Criou. We are an English family with three children from London. This is our holiday home. The Giffre is a beautiful valley, all year round. Wonderful, family-friendly skiing in the winter and in the summer warm temperatures and spectacular scenery. There is so much to do - all sorts of outdoor pursuits are available. Equally, it can be a great place to escape to for some peace and relaxation. Both Morillon and Samoens are very pleasant towns, full of character and extremely welcoming to tourists. The chalet is modern, yet cosy because of the underfloor heating. We love the outdoor space at the chalet too - there is a lot more than in most equivalent properties. Our children can run around quite safely outside without us having to be concerned (although young children should always be supervised as there is a mountain stream which runs alongside the property and the main road is not far either). We love the fact that all the conveniences are just a few minutes drive away and access to the chalet is easy in winter, as it is on the flat of the valley. There are stunning views in both directions and we get the sun all day long. En-suite bathroom to bedroom 1 with bath and walk in shower, wc and bidet. Bathroom 2 with bath, shower and wc. Bathroom 3 wet room shower and sink. Downstairs toilet and wash basin. Not suitable for cars but great for bikes, skis etc. 2 large sofas, 10 seater dining table, flat screen TV with satellite television (French & UK), music system (iPod connector), DVD, PS2 games machine & games, media player and Wi-Fi. Underfloor heating throughout. We normally leave coffee, tea, sugar, water, long life milk, herbs and spices in the kitchen. Help yourself to anything but please replace anything that runs out during your stay. A baby one in the garage! The Chalet is 3km from the Morillon ski lift into the Grand Massif ski area (with 356km of pistes) and 250m from the ski bus stop. A car would be ideal and all Grand Massif ski lifts have free parking. The Grand Massif is on the doorstep of Flaine, Les Carroz and there is also a free bus service to Samoens. The Chalet is also less than 1hr to other resorts, Les Gets, Morzine, Avoriaz, Chamonix, Argentiere, Saint Gervais and Megeve. There are tennis courts in Verchaix and Samoens. Excellent Golf course at Les Carroz - Flaine at approx 1600m with fantastic mountain views. Les Gets has an 18 hole mountain golf course with a superb panoramic view. Avoriaz has a 9 hole course with spectacular views. There is a driving range over water and 9 hole putting green at Samoens by the lake. Outside: Large private garden with a very large decked area, ideal for entertaining or sun bathing. Garden table and chairs provided. Four sun loungers. The garage contains many garden toys, a full-size table tennis table, a child-sized air hockey table, a basketball hoop and table football. There is plenty of storage space for bikes, skis etc. There is one bike already there for guests to use (when it's not snowy) and there are two sledges which guests are also welcome to use during winter months. Utility Room: Washing machine and separate tumble dryer. Cleaning / Towels / Linen: Linen and towels are included and changed on change over days. The property is professionally cleaned in between rentals. However, we do expect guests to leave the property as tidy as they found it. Beautiful chalet - bigger (and of a higher standard) than we were expecting! Really nice property, with great equipment throughout and a high standard of finish, especially in the bathrooms. We were a group of 7 adults but there was still plenty of room, bedding and hot water to support our needs. The housekeeper very helpfully collected/installed our food shopping before we arrived too. Only downside (from our perspective) is that the property is a 5-min drive to the nearest shop/bar/ski-lift, but of course we knew that when we booked, and there's plenty of free parking near the telecabines in Morillon or Samoens anyway. Some people would actually find this seclusion attractive, and of course it makes the garden/vicinity very safe for kids etc.. Owners very helpful. Don't hesitate to book! Chalet Clarine - 5 Stars! We stayed at Chalet Clarine for a family holiday with our now adult children. There were 7 of us in total. 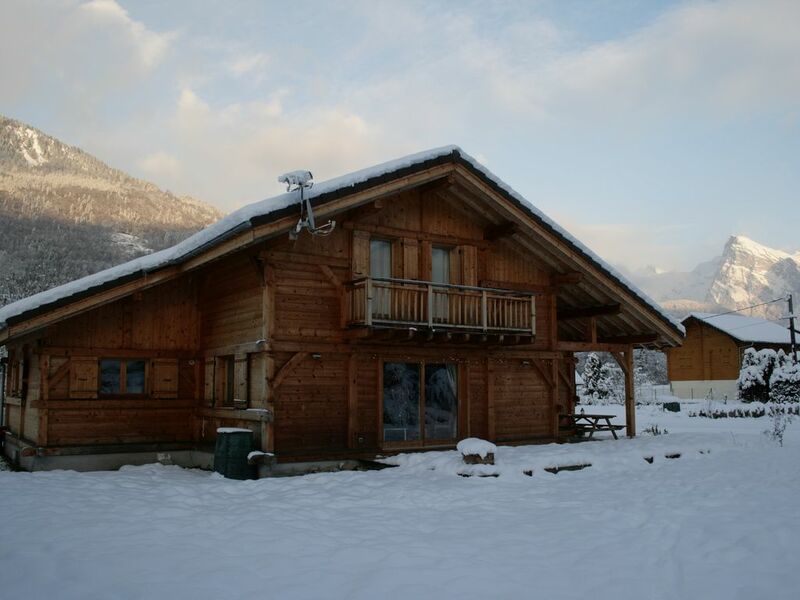 The Chalet is spacious and accommodated us all very comfortably. It is warm, and spotlessly clean, and a real help to have linen, towels and the in out cleaning service provided. Bedrooms are a good size and well equipped. The kitchen is large and everything works well, there is every kitchen implement you need if you want to fully self cater, but there are restaurants around if you wish to eat out and Boulangerie Tiffanie in Morillion for compulsory croissants and pain chocolat at breakfast! The beds are super comfy, showers powerful and hot, also to have 2 bath tubs available is just fantastic after a long days skiing. Although we did not use it all the time, having the TV with English Channels was useful along with the various different electronic games. We preferred the family games and played Monopoly for the first time in years! The location is great being around an hours drive from Geneva and its very easy to find. The centre of Morillion and the gondola is around a 1 km away and then its only a 10 minute drive to Samoens. Chalet Clarine provided us with the perfect base for our holiday, we were able to relax altogether in the evenings and spend quality time together which is sometimes lacking in hotels. I can highly recommend this chalet and would at some point in the future return. This was our third stay at Chalet Clarine and it did not disappoint, yet again! The home from home feel of this chalet makes it our firm favourite. The good quality furniture, fixtures and fittings, plus a well equipped kitchen means we can comfortably slob out after a solid day's skiing in the Grand Massif. The chalet is always clean and warm and is situated in a great spot, just outside of the village of Morillon. There are two large supermarkets within a 10minute drive and plenty of restaurants, cafes and bistros for those who do not enjoy cooking. Claire, the owner, is always communicative and helpful; the booking process always smooth and hassle-free. We drive to the chalet, which takes 7 hours from Calais with one short stop, (the Sunday arrival helps avoid the "Saturday changeover day traffic"), as we prefer to have our car in resort when skiing. However, the Grand Massif ski bus (included in your lift pass) stops just up the road, so a car is certainly not a necessity. This year we also chose to drive to the nearby Portes du Soleil. It took about 15-20 mins and opened up a further, huge ski area for our enjoyment! We have never been to the chalet in the summer but can confirm that the surrounding area is stunning in winter - we can only imagine it is more so when the snow has melted and the sun is out! Thanks for another great stay and see you same time next year Chalet Clarine! Fabulous chalet cannot fault it at all. Six adults stayed here February 2016. Chalet celan and comfy with lots of board games, puzzles and electric computer games and a computer! You will need a car really to get from a - b and it is just off the main road into Morilion so not really walkable. We did have a car and went to the bowling in Samoans which was great fun and good food. Didn't eat out apart from bowling night as my daughter is an amazing cook and just loved the kitchen in the chalet so cooked every night, played games, watched tv and had wine at home! Fabulous holiday cannot complain about anything, well done Claire and Keith I do believe you thought of everything for the winter skier (maybe a larger ski dryer cupboard as there was six adults but thats it). Thanks so much. Glad you had a great time! A moins de 5minutes en voiture de Morillon, et 10 de Samoëns, parkings faciles et gratuits. Chalet chaleureux, agréable, propre et très fonctionnel. Morillon has a swimming lake with a small beach with stunning views of the surrounding mountains and a lakeside cafe/restaurant. Five minutes drive away in Samoens there is a public outdoor swimming pool with water slide. Located only 15 mins from the A40, 55km from the nearest airport - Geneva. With easy access to TGV station in Cluses. TGV Paris - Cluses, about 5h. Car hire is not essential but recommended if you want to explore out of the valley. Morillon - 20 minute walk. Samoens - 45 mins walk/5 mins drive (6km). Annecy - 1 hr drive. Evian - 45 mins. Chamonix - 45 mins, Geneva less than 1 hour. The chalet is 1.5km from the Morillon ski lift into the Grand Massif ski area (with 356km of pistes) and 250m from the ski bus stop. A car would be ideal and all Grand Massif ski lifts have free parking. The Grand Massif is on the doorstep of Flaine, Les Carroz and there is also a free skibus service to Samoens. The chalet is also less than 1 hour from other resorts, such as Les Gets, Morzine, Avoriaz, Chamonix, Argentiere, Saint Gervais and Megeve. There is plenty to do in summer. Thrill-seekers will be tempted by activities such as paragliding, climbing, white-water rafting, swimming, downhill mountain biking etc. For those looking to relax, there are plenty of walking/cycling routes, picnic areas, lakes and a number of the chair lifts remain open during the summer so you can go and get lost in the wonderful mountains. With a car there is also plenty to explore - the historic towns of Annecy and Evian are less than an hour away, Geneva and Switzerland are also easily reached within an hour, and you are a short drive from the Mont Blanc tunnel and Italy. We provide an information folder in the chalet, giving details of local shops, markets, emergency numbers etc. Booking Notes: Prices are for the whole chalet on a self-catered basis per week. Upon completion of booking form a 25% deposit is required. Full payment is required by 60 days before stay. Changeover Day: Changeover days are normally Sundays, however we can be flexible depending on time of year. Notes on prices: Prices are for the whole chalet on a self catered basis per week.